Perhaps we can soon say that this deviation from the unique and great character of these wines has become rare - and to record these producers as heroes who stood firm against a foreign fad. But we may remain cautious a little longer. The producers and suppliers listed may not agree with the opinions expressed - especially the UK suppliers. Roddolo Flavio Monforte Barolo Old!! Giacosa Carlo Az. Agr. Barbaresco Barbaresco 1 label brq only "Narin" barriq - NOT crus! 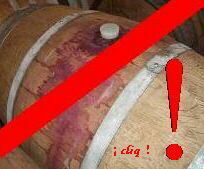 By following this list you may miss some genuine wines that suffer no detectable barrique influence. (For instance, at Cascina Morassino they develop their Barbaresco in barrique before it all goes into large 'botti' - specifically to avoid oak on the nose. The great house of Prunotto, which did not use barriques in the era of Beppe and Tino Colla, today does not use new barriques; clearly the introduction of organoleptic wood elements is not in their philosophy. Enrico Scavino makes a point among his Barolo accounts that he uses "neutral" French oak . And I felt compelled to list Flavio Roddolo who uses exclusively old 'exhausted' barriques. "They are just containers.."). But non-use of new (or 2nd or 3rd passage) barriques is fact - while the lack of excessive oak presence (even the undetectability of oak) is opinion, and may vary considerably year on year. So the only way to give reliable guidance to initially avoiding intrusive oak 'odour' and cloying tannins has been to identify producers who add none. These practices do still occur - in which less tannin (and other constituents) is extracted from the grape, by short or cool maceration, and the diminished quantities replaced by foreign substances, notably tannins, that are unrelated to the product of freshly gathered grapes that is: wine. The non-use of clarifying agent, besides indicating less interference with the process, is useful information for vegetarians, and especially vegans, who avoid consuming egg and fish products. (The mineral 'bentonite' is not generally used on fine wines as is does extract even more character from the wine than do other agents). The above information is provided with the intention simply of being helpful; no responsibility is accepted for its accuracy. No entry is sponsored.